Arduino is an open source embedded platform which is available in a huge variety of shapes and sizes. Here you can see a Trinket device (based on Arduino) in a tiny house that I printed as a test. It is a great place to learn how to connect programs to hardware. This is a really good value kit that you can get from ebay. Just search the site for "Arduino Sintron". It should cost you around 25 pounds or so. When you buy the kit you are offered a link to lots of resources which you can use to get started with all the elements of the kit. If you are worried about losing parts we've made a page of sticky labels that you can use to put on bags for each component. If you are not sure which component is which, you can use this identification page to help you work out which is which. The kit comes with a nice little plastic box, but you might like to get a larger one so that you can store designs you are working on. There's a Sintron version of the getting started document here. It's from one of the labs at Hull where we use this kit. Take a look at the exercise below for more things to do. To keep things simple we are going to base the exercises on a standard platform. You can use other Arduino devices if you like, but if you go for the one we recommend you should find that everything just works. 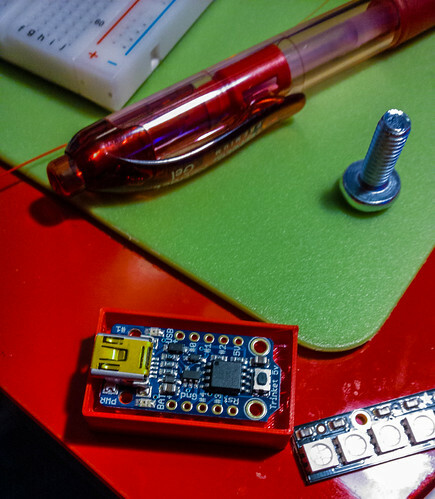 We are suggesting that you get hold of a Sparkfun Aduino Redboard kit. You can get this from HobbyTronics, among other suppliers. It contains everything you need to get started including an Arduino compatible board, usb cable, tiny breadboard and some interesting devices including touch and bend sensors. It costs considerably less than the price of a video game, at around 36 pounds. You can get cheaper kits but we like the selection of devices you get with this one. Also, it is red. If you want to write software for the Arduino you will need to download and install the software for your PC or Mac. It is free to install and the environment works in the same way on both platforms. The only slight difference is the installation of the hardware drivers for the USB connection to the Arduino. There is a great description of how to download the Ardunio software for the Redboard here. There is a great description of how to install the USB drivers here. There is also a great description of the Sparkfun Redboard here. This content takes you through writing an downloading your first Arduino program and will work for standard Arduinos as well. You can find the notes for the first session here. You can find the notes for the second session on Peter's site here. You can find the notes for the third session here. You can find the notes for the fourth session on Peter's site here. You can find the notes for the fifth session here. You can find the notes for the sixth session here. You can find the notes for this session here. If you have borrowed one of the C4DI Arduino devices please fill in your loan details here. Sign up with your email address to receive an update when we post new content here. .